Trumpet frontman for Anderson Paak on his worldwide tour. February appearance on the Jimmy Fallon Show. Month-long residency at NYC’s iconic Blue Note. 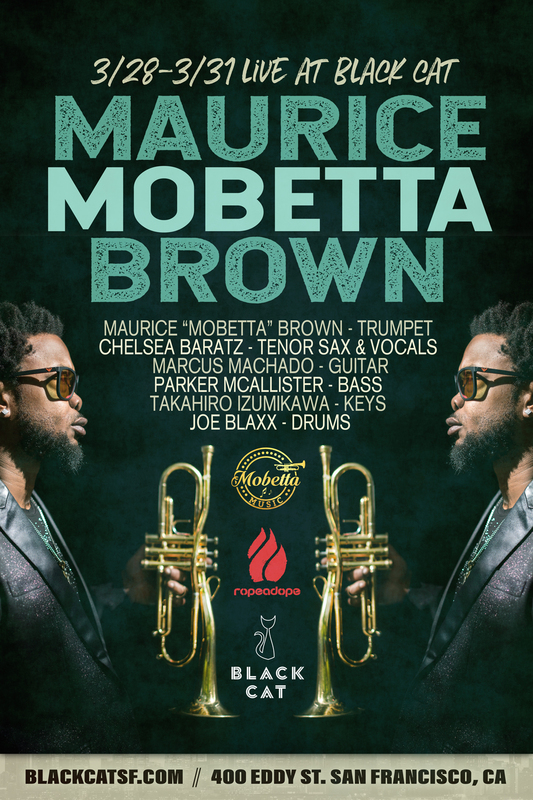 Maurice “Mobetta” Brown hits the stage of Black Cat flying high, fusing jazz, hip-hop, blues and rock to create a sound tantalizing sound unique to Mobetta. A member of Tedeschi Trucks Band since 2010, he shared the 2011 Grammy for Best Blues Album. He has recorded and performed with exceptional artists across genres, including The Roots, Santana, Roy Hargrove, Aretha Franklin, Talib Kweli, Wyclef Jean, De La Soul, Musiq Souchild and others.